I’ve now been teaching Nursing for over six years. And this semester, as a WID fellow, I have the opportunity to look at my development as a teacher. One could say I’m reflecting on and examining (critically) my skills as a teacher. But when I do so, I realize how the situation and environment affects my teaching. Our classes are big, with forty students in them. Most of the time, I am so focused on content in the classroom that I just stand in front of the class and give powerpoint presentations. I usually try to have some kind of activity at the end of the class, something to reinforce the important parts of the topic, or what the student “needs to know”. Part of this has to do with the licensing examinations given by our professional order. Before new graduates can practice as nurses, they have to pass two examinations. One is written, and one is a practical exam. Therefore, our faculty has made the decision to base most of our assessment methods on these two types of exams. This has led to the students’ dependence on powerpoints. Because we give them so much content, they have realized that all the “need to know” stuff is on the presentations. And so, they memorize it. If a teacher structures a class without using this tool, the students become anxious, unable to pick out the “need to know” from the “nice to know”. Another factor that affects our teaching is the use of a conceptual model in structuring the courses. We teach the students the Nursing Process using this model. Nursing Process is really just a structure for solving problems. For over thirty years, nursing schools have used models to organize our teaching of the Nursing Process. Unfortunately it often doesn’t seem to have helped the students learn. I think this is mostly because all nursing models come with made-up terminology that is hard to understand. In the model we use at Dawson, a “particularized self-care demand” means “what your patient needs”, but after three years of using the model, the students are often unable to use such terms. They cannot see that our model, Orem, is a problem solving model, or tool. They think it’s just something they have to memorize and can forget once they graduate. I have decided to focus my efforts in improving the students’ understanding and therefore retaining the content by simplifying my teaching. How can I move away from the status quo to facilitate the students’ learning? Because I think the conceptual model should be a tool for problem solving and not part of the problem, I’d like to start with this. I recently read an article about Nursing education entitled “Are There Better Ways to Teach and Learn? “ (Stokowski, L. A., Medscape Nurses). Here is a quote that got me thinking: Nurses must learn how to assess, use, and manage knowledge, rather than trying to pack thousands of facts into their heads, hoping to be able to retrieve them when needed. The Future of Nursing Education report emphasized that “we need to be hardwiring the ability to manage and use knowledge in real time in both education and practice.” Knowledge management permits the nurse to access that knowledge with new tools and strategies. Nurse educators need to improve the links between knowledge, clinical reasoning, and practice. The curriculum must emphasize competent performance through active learning. I’ve been struggling to develop assignments and exercises for students to do involving writing, because of the issues I’ve mentioned before. However, then I realized that there is room in our current pedagogical model to do this. An essential part of what nurses do is the documentation of our assessments, interventions and even communication. Not only do we need to communicate what we’ve done, but also document in writing who we’ve communicated with. We call this charting. The chart (or patient file) is a legal document, and therefore accuracy and precision are important. However, at the same time, a lengthy narrative is undesirable, because other healthcare professionals reading it are usually pressed for time (and patience). Therefore the ability to be both precise and concise at the same time is an important skill to master. Students have difficulty with this throughout their studies, often only producing acceptable charting in their last semester. They can’t distinguish what information should be documented from what is not necessary to document. I have been thinking that if we give them more practice with it both initially and throughout the program, that they might be more successful with this skill. It could be used as means of developing critical thinking at the same time. For example, in the case study, I included an event that needs to be followed up using an Incident Report – a formal reporting of a mistake. The students are asked to identify which piece of information needs additional documentation. I’ve developed a case study for this purpose. I would either hand out copies of the case study, or put it up on the screen. The students would then work either in groups, or by themselves to identify the critical information to document, and then actually write out the charting on a piece of paper. It could be looked at by a peer, or by a group to be critiqued. At the end of the exercise, I could show how I would have charted for this patient. The students could be given an exercise to do at home, or more case studies could be presented in the classroom. The more I think about this, the more excited I am. Using several case studies over the semester, the students might develop the abilities to chart appropriately, but also to develop our favourite skills – those that lead to critical thinking. Last month, I developed an assignment to improve the students’ ability to document in the patients’ Progress Notes. 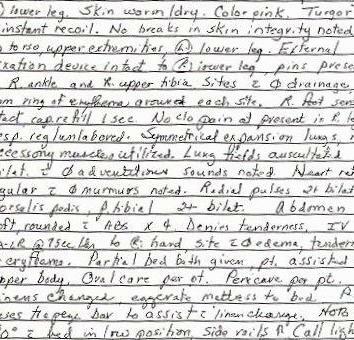 Each nurse has to document her assessments and what happened to the patient over the course of her shift. One hundred and fifty years ago, Florence Nightingale firmly established that observations and interpretation of them were the basis of nursing practice. This is still this case, but I think the same type of assignment can be used to trace how the student is interpreting the information and making clinical decisions . So now I’ve adapted that initial assignment after reading several articles about improving students’ abilities to make sound clinical judgments. A number of nursing schools are focusing on this skill/ability. I don’t really know what to call it, because it’s so much more than that. One example of a framework looks at thinking and knowing, but also context, to analyze the student’s decisions. An important part of it is reflective thinking, particularly when something goes wrong. This is (I hesitate to say an opportunity) the time for the student to look back at how she came to this decision, and what she was thinking that led to it. It involves prioritizing as well, as the student moves from caring for one patient to caring for four patients. It looks at the culture of the hospital unit – Was it easy to approach someone for help? Do the doctors listen to the nurses and value their input? There’s a myriad of factors that influence one’s decision. So, with that in mind, I’ve expanded the assignment to include Ian’s suggestion of a double-entry notebook in which the student has to describe what she saw and did during the day. For her nursing interventions, or for her decisions not to do anything, she needs to write what she was thinking at the time. What factors led her to make that choice? I have included some questions that the student might find helpful when thinking over her decisions. Let’s see how it goes. I’n in the hospital tomorrow with a group of 2nd year students, and I’m going to try it out with them.